Three piers for £6? Now that’s a bargain but there’s a catch – you may have to get your running or walking shoes on. Racers, runners, walkers, amblers and trundlers pick a pier – or all three – and their pace. 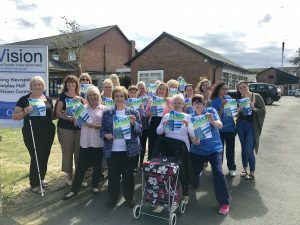 The distance spans three, five or six miles depending on whether they head for South, Central or North Pier – and back to N-Vision’s base at Bosworth Place, Squires Gate. 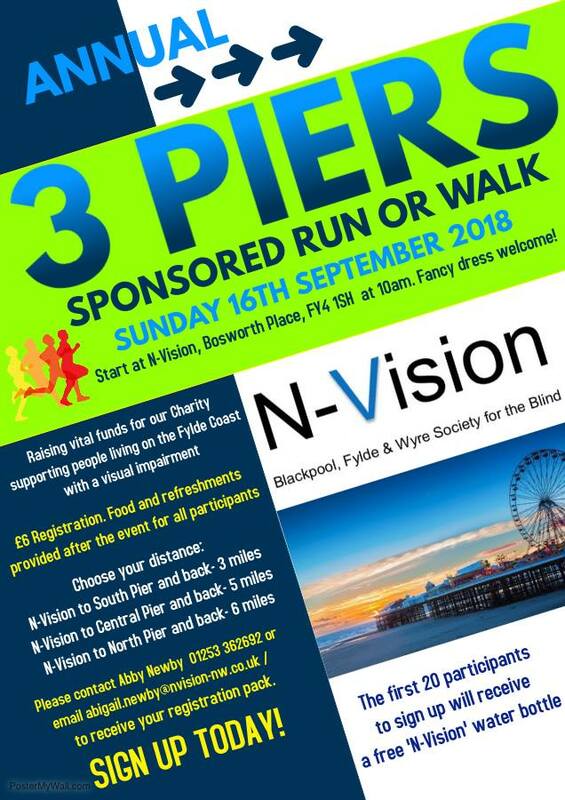 The 3 Piers sponsored run/walk raises vital funds to help the independent local charity support 2200 people living on the Fylde – from coast to urban and rural communities inland – with low or no vision. The charity dates back to 1910 and runs a range of community services, café clubs, social and activity groups, Low Vision Centre, sight loss support, Talking Newspaper, and more – including the Princess Alexandra Home which offers residential and respite accommodation. Organiser Abby Newby, who works at the charity, explains: “After doing sponsored walks for several years N-Vision introduced the 3 Piers last year to make the event accessible, so we should have a distance that will suit (almost) everybody – while the six-mile option will appeal to runners. The 3 Piers starts from N-Vision’s base at Bosworth Place, Squires Gate FY4 1SH, at 10am – fancy dress welcome. It’s £6 to register. You can do so by contacting Abby at (01253) 362692 or emailing her at Abigail.newby@nvision-nw.co.uk to receive your registration pack. Fylde Coast YMCA are providing the warm-ups free of charge. The first 20 participants to sign up will receive a free N-Vision water bottle. Food and refreshments will be provided after the event. The event is also raising awareness of the charity’s work ahead of National Eye Health Week which starts on September 24 and features displays by the charity and specialist medics on the mezzanine at Blackpool Victoria Hospital, a trade exhibition at the charity of high tech visual aids, innovations, appliances and software from the UK’s leading specialist suppliers and other events to encourage all of us to have regular eye health tests.